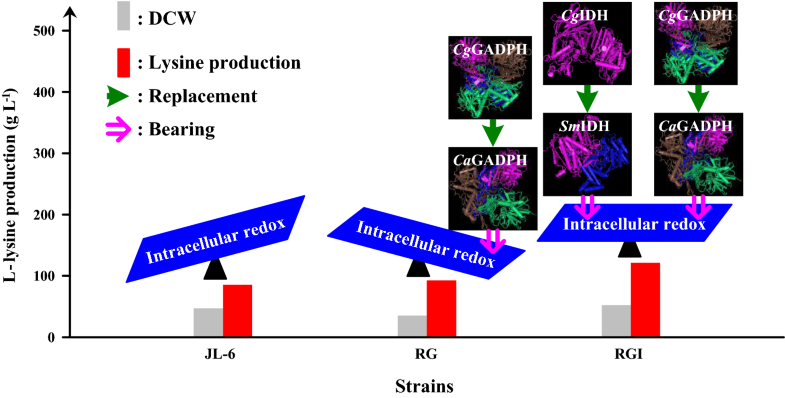 Corynebacterium glutamicum has three major redox systems, i.e., NAD(H/+), NADP(H/+) and reduced/oxidized glutathione (GSH/GSSG), which are used to adjust the intracellular redox state . They are also involved in other physiological functions, including regulating the energy transfer, controlling the cell life cycle, monitoring the cellular signaling and modulating the microbial virulence [1–3]. 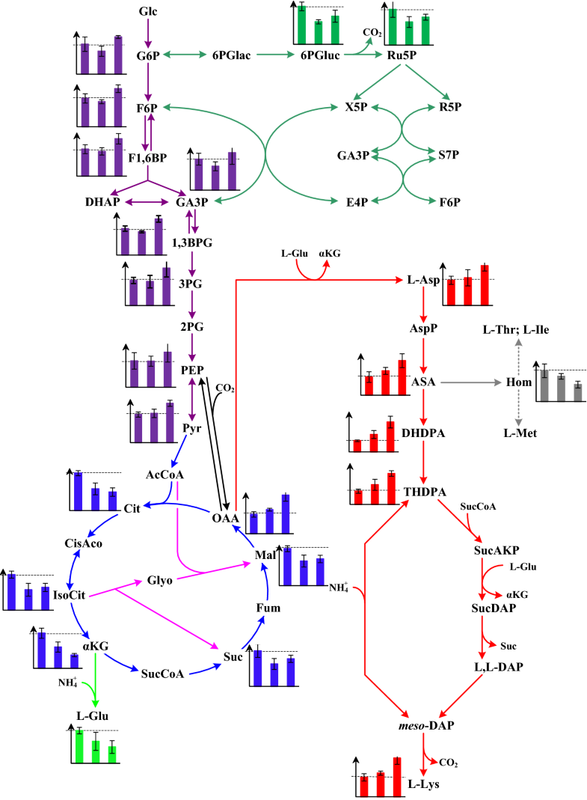 NAD(H/+) and NADP(H/+), as the most important redox cofactors in metabolism, not only provide reducing power for the energy-conserving redox reactions but also act as electron acceptors in the catabolic substrates . However, NAD(H/+) is preferentially used in catalyzing substrate oxidation, whereas NADP(H/+) is mainly used in catalyzing substrate reduction [5, 6]. 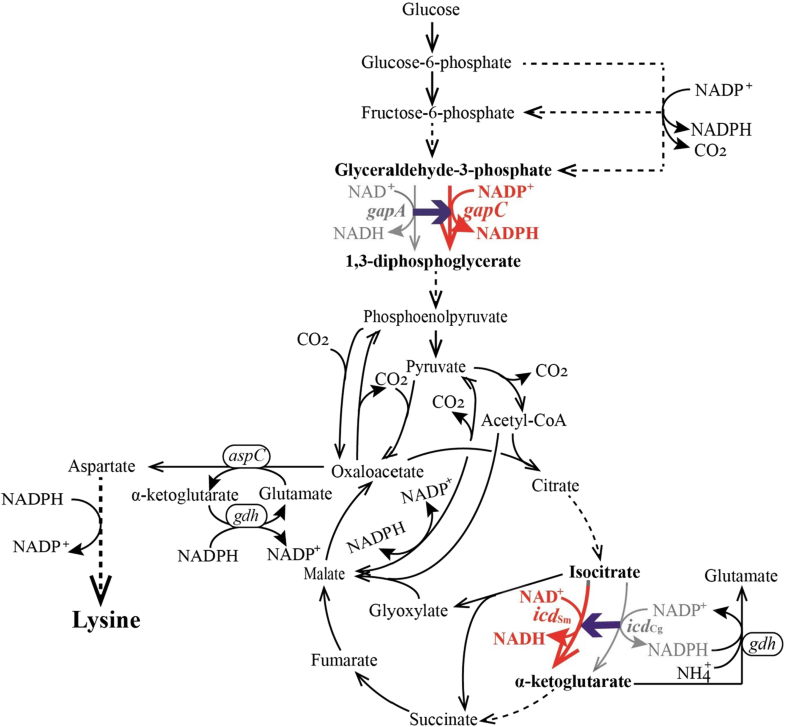 Therefore, balancing the oxidation–reduction state of NAD(H/+) and NADP(H/+) is crucial for both catabolism and anabolism. Some examples have illustrated the importance of redox balance and availability for producing the fine chemicals including amino acids [7–9], vitamins [10, 11] and lipids [12, 13]. l-Lysine, as an essential amino acid for animals and humans, is mainly produced by C. glutamicum or its derivatives, which were created by traditional mutagenesis-screening techniques or by genetic engineering [14, 15]. Notably, 4 mol of NADPH must be supplied for 1 mol of l-lysine biosynthesis from oxaloacetate, and thus numerous studies have focused on engineering the metabolism of NADPH for improving l-lysine producing strains [9, 16–19]. For example, genetic modification of the native glyceraldehyde-3-phosphate dehydrogenase (GAPDH) has been proven to improve the l-lysine production because of the increase of NADPH availability [17, 19, 20]. 12934_2019_1114_MOESM1_ESM.docx Additional file 1. Additional tables.